Viking Vets - Vicki Seal - Your local vet based at Chevening, Station Road, Henbury, Bristol BS10 7QQ. Vicki qualified from Bristol University in 2000 and worked in mixed practice in Wales initially, before settling down at Viking Vets in January 2003. Vicki loves all aspects of her life at Viking, which after all these years really is home from home, but has a particular interest in eyes. 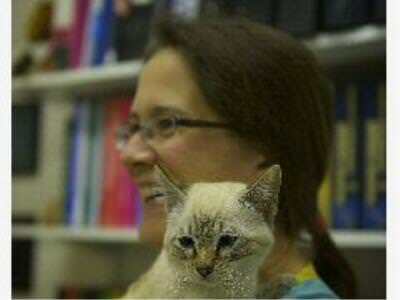 This led to her postgraduate training and additional qualification in Veterinary Ophthalmology. "One of the things that first attracted me to this practice 11 years ago was the strong family feel, the caring nature and dedication of the team. Since then, the team has grown but the sense of caring, family and dedication remain as strong. "What makes me now feel really old is seeing some of my old friends come in and realising they are now 'geriatric' when it seems like only yesterday I was seeing them as puppies or kittens! "I feel privileged to work in a practice where I have the joy of seeing so many fabulous pets who over the years have become very dear to me. Of course, there are difficult times, sad times and worrying times, but what stays ever constant is the genuine love and care we all have for our patients and for each other and that is what gives us all joy in our job and keeps us going through any adversity." Outside of work, Vicki is generally to be found larking about with her family, gardening, swimming or singing! She lives with her husband and two small children, and a very independent moggie called Esme.